Synthetic diesel is now finally an option, and can run in existing diesel trucks and infrastructure. Nuclear powered factories extract excess carbon dioxide from seawater and crack that water to get hydrogen, mix the CO2 and H2O together, and get diesel. It’s CO2 neutral, and infinitely recyclable – and crucially, it has just become cheap enough. The best bit? The cost of the synthetic diesel includes all the nuclear power plants to run it, so when peak oil doomers ask “Yeah, but how many nukes is it going to take and how expensive will all that be?”, you can tell them that their tired old ‘Batteries not included’ arguments are invalid. The nukes are costed in each litre of diesel. It means that the nukes scale as the synthetic diesel industry scales up. Yes it’s a big investment up front, but the world has trillions invested in oil infrastructure. 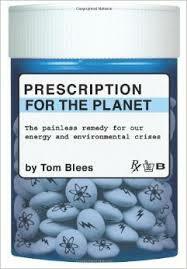 We don’t have to abandon all of that infrastructure even though we do have to abandon the fossil oil that started it. The following post is originally from Brave New Climate. And remember, if you are not convinced by the end of this article, recyclable boron pellets are another option! Liquid hydrocarbons account for about one third of fossil carbon dioxide emissions, and while transition to electric vehicles is possible for some passenger transport, it is simply not feasible to substitute for liquid fuel in most long haul transport, aviation, or agricultural and industrial prime movers. Synthesizing fuel from carbon dioxide extracted from air is possible in principle but horrendously expensive. Yet, if we are to achieve CO2 levels of 350 ppm from our current 392 ppm, CO2 removal from the biosphere appears necessary. The work was done by the US Navy (full text here), and by the Palo Alto Research Center (PARC),who each developed membrane processes to extract CO2 from seawater. The Navy’s interest is military – shipboard production of synthetic jet fuel far from supply lines – but I figure we can beat this sword into a ploughshare. Rather than going after the CO2 directly with chemical scrubbers, they use electrochemical processes to split seawater into an acid and base stream, and the CO2 bubbles off from the acidified water. The two streams are recombined and returned to the ocean. While these processes are novel, they are very similar to a number of ion exchange processes, including desalination, which are currently deployed at scale. The Navy costed the production of jet fuel at sea. But they neglected to include the cost of energy for the carbon capture process. I used the PARC research to estimate it and include it in the Navy costings. I arrived at $1.78 per litre. I was also able to calculate the cost of just the carbon capture part of the process at about $114 per tonne of CO2. But if we don’t insist on running these processes on an expensive ocean-going platform, the cost drops to $0.79 per litre for synfuel and $37 /tCO­2. The costs are rough and there are a number of caveats, but this is surprisingly low. To put it in context, the American Physical Society recently reviewed carbon capture from air, and “optimistically” costed it at about $600/tonne. I describe the CO2 capture and fuel synthesis processes below, and show how the costings were derived. 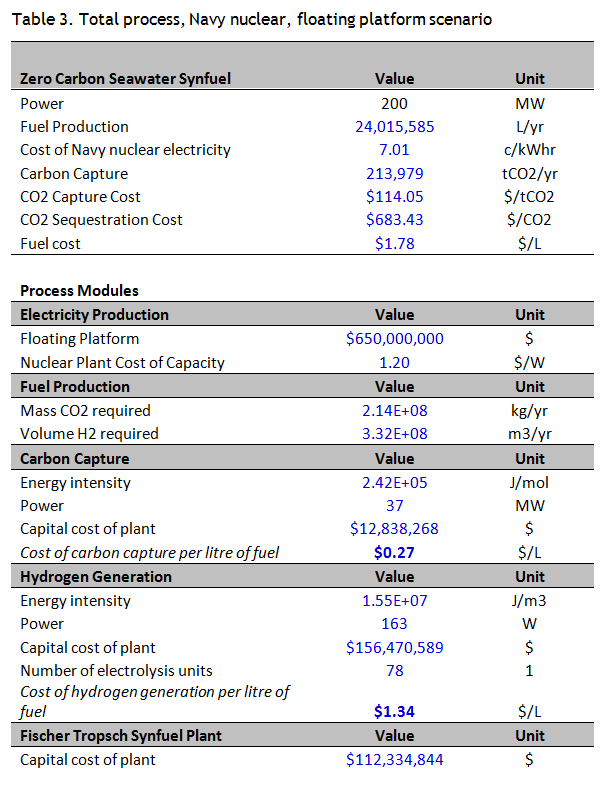 I also consider how the costs would change for civilian nuclear electricity (Table 1). In brief, accepting the Navy’s assumptions leads to plausible prices for synfuel and carbon capture, but the amount of new power generation required makes very large volume production unlikely. A spreadsheet with my cost calculations can be downloaded here: Synfuel cost model. Concepts for carbon capture from air have been developed, but never realized. The basic idea is to pass air over alkaline scrubbers, such as amine or carbonate solutions, extract the CO2, and recycle the scrubber solution. Because the concentration of CO2 in air is so low, a very large surface area is required, and the process is energy intensive and overall very expensive. The American Physical Society prepared a technology assessment on this approach in 2011. The results weren’t promising. A 1 Mt/yr CO2 extractor comprised five 1 m x 1 m x 1 kilometre long air contactors, occupying about 1.5 km2. The cost, so far as it could be determined for an undeveloped technology, and making optimistic assumptions, was about $600 per tonne. Another 2011 study estimated costs based on current experience with trace gas removal systems at about $1000 per tonne. But CO2 is very soluble in water, and its concentration in the ocean is about 140 times higher than in air. So we are using the whole of the ocean surface as an air contactor right now – for better or worse! The extraction system is ‘built’, we just need to recover the CO2. The PARC and Navy researchers both used the clever approach of acidifying seawater with H+ions generated by water electrolysis, forcing the CO2 to bubble off. The PARC system in the illustration used a stack of semipermeable membranes sandwiched between two electrodes. Inside the stack, H+ is generated on one side of a membrane, and OH– on the other, which creates alternating acid and alkaline compartments. CO2 is recovered as gas from the acid stream, which is then recombined with the alkaline stream and returned to the ocean as CO2-depleted seawater. The Navy process chemistry is similar, but uses ion exchange resin beds instead of the internal membrane stack. The process has not been scaled up, but the technology and challenges are similar to reverse osmosis desalination, so there seems to be no in principle reason why it couldn’t be. The lifetime of membranes operated in seawater is also unknown, but again, membrane desalination of seawater shows the problem can be overcome, using techniques like polarity reversal to remove scale formation. This process doesn’t require material inputs of acids or bases – they are generated internally by electricity, and it is non-polluting – only the original seawater is discharged, minus the CO2. The process consumes 242 kJ per mole of CO2. The Navy estimated the capital cost of the carbon capture process at $16m for a 715 tCO2per day plant. Unfortunately no justification is offered for this cost, so I am unable to check it, and it seems quite low. I have used this cost as given, but it may underestimate the CO2 capture cost. As a purely speculative exercise, what would it take to draw atmospheric carbon down to 350 ppm with just this technology? If we follow the American Physical Society in their technical assessment of direct air capture and set a target of reducing atmospheric CO2 to 350 ppm by capturing 400 Gt over a hundred years, we would need to collect 4 Gt/yr, from the perspective of an already decarbonised society. We would require the power of about 700 AP-1000 nuclear reactors. At the Chinese cost of $1.3b apiece and an 80 year lifetime this would cost a bit over $1 trillion dollars. That sounds like a lot of money. But its only about the cost of America’s 2003 Iraq War spread over the century, so I guess it’s a question of priorities. The feedstock for fuel synthesis is hydrogen, and a source of carbon. Commercial synfuel operations have all used fossil carbon, such as natural gas, or coal in coal-to-liquids processes. They address availability of liquid hydrocarbons, but are terrible emitters, using fossil carbon both as a material input and to provide the energy to run the process. CO2 extracted from seawater is an ideal carbon source – it embodies negative emissions and is very pure, free of sulphur and other impurities. Fischer-Tropsch produces a range of pure alkanes, with no aromatics or sulphur, although heavier hydrocarbons may require cracking. Alternative fuels such as methanol or dimethyl ether could also be produced from the CO2 and H2 feedstock, and would require no further processing. So the end product is much closer to a final fuel formulation than, say, crude oil. A source of hydrogen is required, and the energy required to produce the hydrogen is the single most expensive component in the whole process. 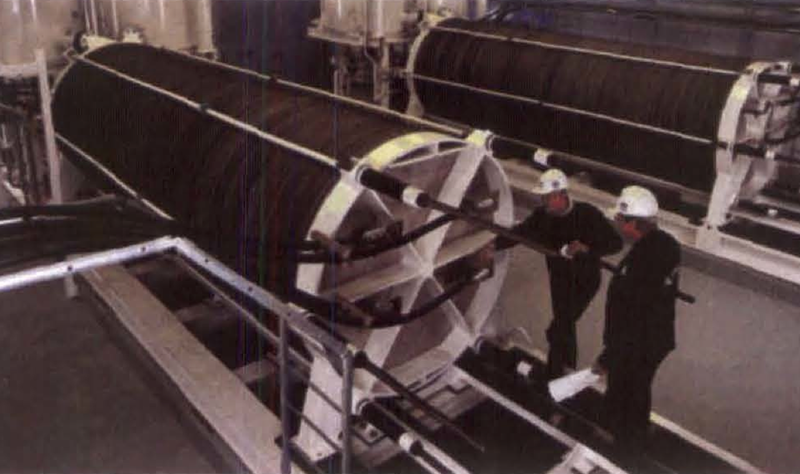 The Navy used performance data for large scale 2 MW commercial water electrolysis units that cost $2m each and can produce 485 m3 per hour of hydrogen. Suppose the whole process were powered by Navy nuclear electricity. The USS Nimitz has two reactors that together produce 200 MWe. Using 37 MWe for CO2 capture and 163 MWe for hydrogen generation from 78 electrolyser units, they could produce 24 million litres of fuel per year, for about $1.78 per litre (Table 1). For context, a small oil refinery produces about 550 million litres per year, while Sasol’s South African coal liquefaction plant, the largest commercial Fischer-Tropsch plant, produces 8.8 billion litres per year. To produce the same fuel output as the Sasol plant the Navy process would require about 73 GW. So while the cost per litre may look plausible, the infrastructure required is huge. A nuclear site doesn’t come for free, even on land, so these are lower limits to the possible costs. Maybe we should look at current civilian LCOE nuclear electricity costs. Nicholson et al. reviewed available data in their 2010 Energy paper and reported electricity costs for established nuclear power. Table 1 shows synfuel and carbon capture costs for median and low end electricity costs for established nuclear power, and for the low end of current Chinese nuclear builds. The cheapest Chinese cost gives synfuel at just $0.82 per litre, and carbon capture at just $39 per tonne. The other major cost component is hydrogen production by electrolysis, which is very energy intensive. There are more efficient ways to do this, such as using high temperature solid oxide electrolysis cells, or the sulphur-iodine thermolysis cycle. These processes operate above 800 °C. High temperature gas reactors could provide this heat, and an efficient HTGR-SI hydrogen production system would further reduce the synfuel cost (though not the carbon capture cost). 1. 2012 Annual Energy Outlook, US EIA. 2. Australian Energy Technology Assessment, Aust. Govt. Bureau of Resource Economics and Energy 2012. 3. Willauer, Hardy & Williams, Naval Research Laboratory 2012, with minor changes. 4. Nicholson, Biegler & Brook, Energy 2010. Carbon dioxide can be captured more readily from the flue gases of either coal or natural gas power plants. 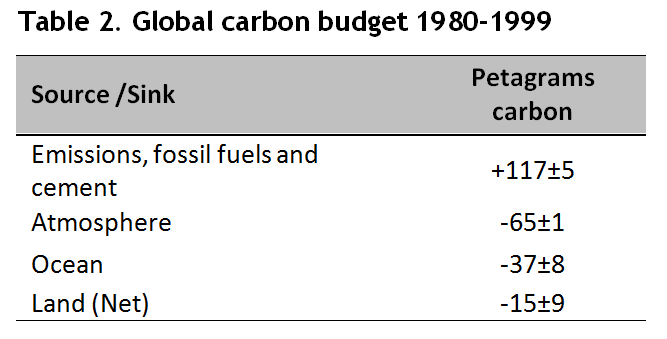 The IPCC estimates carbon capture costs from these sources as US$15-75 per tonne CO2. If we are committed to burning more coal, we might at least use it a second time before releasing it to the atmosphere. A coal plant supplying CO2 to a Fischer Tropsch plant collocated with a high temperature gas reactor producing hydrogen would produce carbon neutral liquid fuel. The overall carbon accounting for the electricity and synfuel would be roughly the same as for sequestration, if the synfuel substituted for oil. It would also avoid the difficult problem of finding a permanent sequestration solution for the CO2. Its not negative emissions, but it is at least emission free. Is carbon capture from the ocean worth a carbon credit? Does it matter whether CO2 is captured from the ocean or from the atmosphere? I’ve assumed not, so long as CO2 is removed from the biosphere. Atmospheric CO2 causes global warming, oceanic CO2 causes ocean acidification. Both have serious consequences. But if ocean uptake of CO2 were very slow, burning synfuel derived from oceanic carbon would be just as bad for the climate as burning fossil fuels. If the climate were more sensitive than ocean pH to anthropogenic CO2, we might prefer to leave the carbon in the oceans. Would seawater carbon capture benefit ocean acidity, or climate, or neither? Table 2 shows the distribution of carbon between air, land and sea over a recent twenty year period. Roughly half of our CO2 emissions end up in the atmosphere, a third in the ocean, and a sixth on land. There is substantial equilibration between ocean and air on a timeframe short enough to be relevant to climate. There is a complicated tradeoff between marine and climate impacts of CO2emissions, but it appears carbon capture from either reservoir would be beneficial. We’re not going to be manufacturing the world’s diesel from seawater anytime soon. There is a limit to the rate at which we can roll out zero emission power capacity, nuclear or otherwise, and for a long time the most environmentally effective application will be to displace coal power, and gas. But if we take seriously the need to decarbonise our energy systems, this will have to happen, most likely by mass production of modular nuclear reactors. It would take many decades to build that capability. But by then, in a warming world suffering from ocean acidification and hydrocarbon depletion, zero emission synfuel at $1 per litre, and carbon capture at $40 per tonne would look like a bargain. Maybe its time to stop talking about carbon capture and storage, and start talking about carbon capture and synfuel. The Navy researchers provided a rough costing of an ocean-going nuclear powered carbon capture and Fischer-Tropsch synthesis plant, and came up with a fuel cost of production of $1.52 per litre. They did however neglect to include the cost of energy for the carbon capture process. I constructed a revised cost model that includes the energy for carbon capture, which I took to be the same as measured by the PARC researchers for their process (242 kJ mol-1). So I write P = QR where R is the hydraulic resistance. If the max flow occurs at the max pressure, R = 350 kPa/35 cm3s-1 = 1010 Pa s m-3. The experimental flow rate was 2.5 cm3s-1. So I can write power = PQ = Q2 R = 0.0625 W for 2.5 cm3s-1, or 2.5 MW for 100 m3s-1. This is approximately 1% of total process power, so its a minor component, and I don’t include it in the cost. I allowed the carbon capture and Fischer Tropsch plant costs to scale with production capacity. Otherwise I have followed the Navy costs and assumptions, including a cost of capital of 8% pa and annual operation and maintenance expenses of 5%. The main line items are given in Table 3. For more details, refer to the Navy paper and the spreadsheet. Some of the Navy capital costs are unsourced and I am unable to verify them. These include the cost of the CO2 capture and Fischer Tropsch plants, given as $16m and $140m respectively, per 82 000 gallons per day fuel output. I take these values on faith. The final cost I arrive at is $1.51 per litre, the same as the original researchers – the increase in assumed power is roughly the power required to run the carbon capture, so the changes mostly cancel out. This spreadsheet was then used to model the alternative scenarios in Table 1.